A young mother begins to suspect her son may be an imposter. "Do you ever look at your kids and not recognise them?" It's a question many parents have probably asked with regard to the little monsters that keep them up at night, drain their financial resources and eat them out of house and home, but in writer/director Lee Cronin's feature debut, The Hole in the Ground, a young mother asks the question quite literally when she begins to suspect her own little monster may actually be just that. Having recently walked away from a physically abusive relationship, Sarah O'Neill (Seána Kerslake) and her young son Chris (James Quinn Markey) relocate to a 'fixer-upper' farmhouse in a heavily forested area of rural Ireland. Their introduction to the small community comes in the form of an ominous encounter with an elderly woman (Kati Outinen) who refuses to get out of the middle of the road, simply standing there mumbling away incomprehensibly to herself. Exploring the forest that surrounds their new home, Sarah and Chris come across a giant - you guessed it! - hole in the ground. Could it be a sinkhole, or something a little less natural? Whatever its origins, it appears to unsettle Sarah. That night, Sarah awakens to find Chris has vanished. Grabbing a torch, she searches the woods, calling his name frantically. Back at the farmhouse, Sarah is surprised to find a half-awake Chris, who claims he never left the house. The following day, Sarah and Chris have another creepy encounter with the elderly woman, whom locals know as "Walkie Talkie". Seemingly agitated by Chris, the woman slams her head into the passenger window of Sarah's Range Rover, shouting a warning to Sarah that "He's not your son!" When Chris begins displaying strange behaviour, Sarah becomes convinced that Walkie Talkie's warning may have had some truth to it. 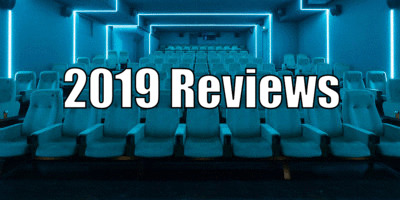 Cronin's film isn't going to win any awards for originality, borrowing, as it does, elements from a slew of genre films. 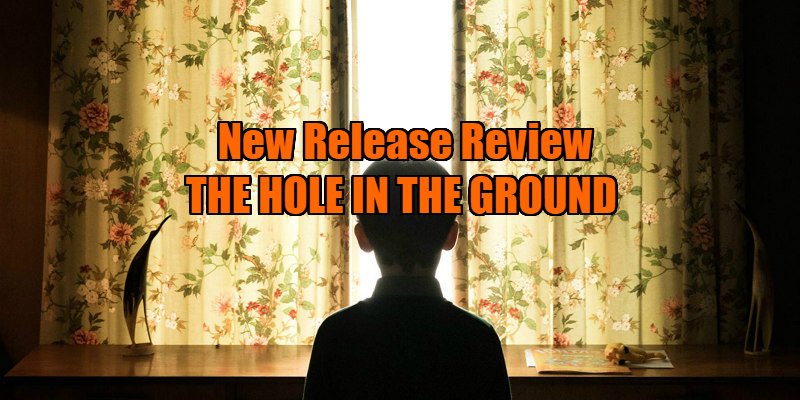 At its core, The Hole in the Ground is a 'Body Snatchers' film with a dash of Village of the Damned thrown in for good measure, and its basic plot is essentially Goodnight Mommy in reverse. Where that Austrian thriller had a pair of young boys suspecting their mother had been replaced by some sort of impostor, here it's Mommy's turn to cast doubts on the nature of her child. That said, a talented cook can rustle up something fresh from leftover ingredients, and Cronin mines his generic premise for all its worth. Along with cinematographer Tom Comerfeld, Cronin exploits the creepiness inherent in the swaying trees and overcast skies of Ireland's County Wicklow, a location horror fans and cinephiles may recognise from Robert Altman's Images, a film which Cronin deliberately nods to at points here. Such a great location, combined with astute and subtle FX work (the titular giant hole is a striking creation, its digital/practical seams invisible) makes The Hole in the Ground a lot more visually impressive than its bigger budgeted Hollywood rivals from the likes of James Wan and the Blumhouse stable. 'Less is more' appears to be Cronin's mantra here, largely eschewing any outlandish set-pieces in favour of slowburning dread. His leading lady Kerslake is a perfect foil for this sort of thriller, her expressive eyes regularly used to convey some horror just off screen. Cronin and co-writer Stephen Shields never allow their film to get sidetracked with unnecessary subplots (there's no romantic foil/male saviour for Sarah) or diversions into pointless backstory (Sarah never makes the clichéd visit to the local library to research the history of the titular pit); rather they allow the audience to fill in the ambiguous gaps. Sarah's past relationship is handled with wonderful economy, a scar on her forehead she keeps covered with her bangs enough to let us put two and two together here, where a Hollywood movie would likely pepper the film with needless flashbacks. It's in this element that the film's literal plot crosses over subtly with its subtext. While Sarah has dark features and speaks with a working class Dublin brogue, her son has blue eyes, fair hair and the refined speech patterns of the middle classes. Even before she begins to suspect some unnatural force has possessed Chris, Sarah already likely feels that her boy has more in common with his father than she would like. Viewers primarily seeking a unique premise may find The Hole in the Ground disappointingly derivative, but for horror fans weary of movies that favour heavy plotting over the sort of brooding atmosphere and chills on offer here, Cronin's debut suggests he's a filmmaker who understands what truly makes this genre tick. 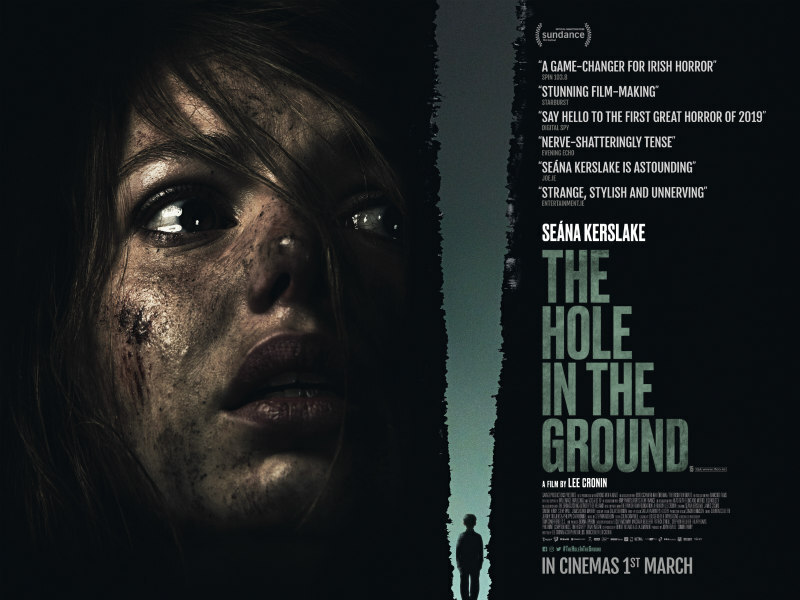 The Hole in the Ground is in UK/ROI cinemas March 1st.